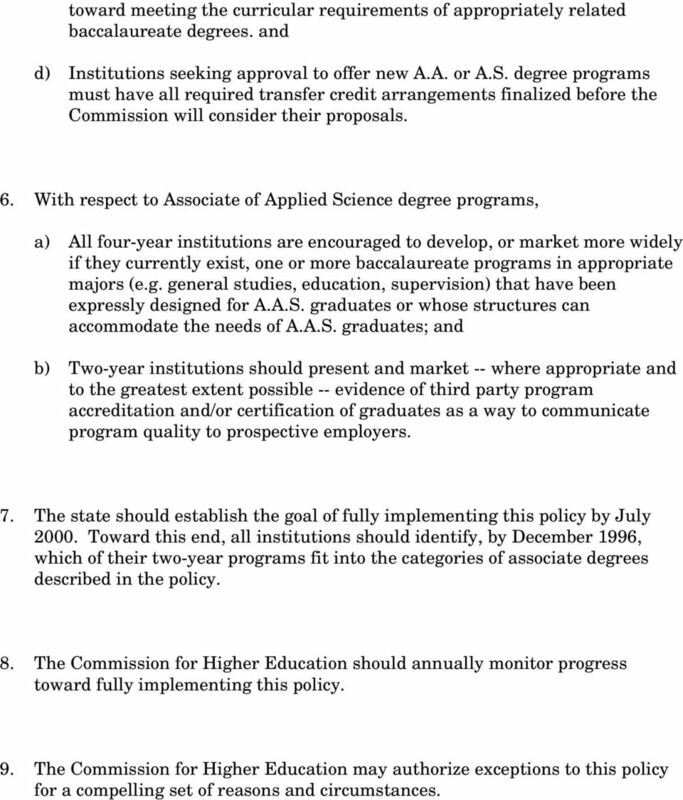 Download "COMMISSION FOR HIGHER EDUCATION Friday, June 14, 1996"
1 COMMISSION FOR HIGHER EDUCATION Friday, June 14, 1996 DECISION ITEM A: State Policy on Associate Degree Programs Offered at Public Institutions Staff Recommendation Background That the Commission for Higher Education approve the State Policy on Associate Degree Programs Offered at Public Institutions, June 5, As part of the Commission for Higher Education s study of two-year instructional opportunities, the Commission has periodically discussed working papers on a variety of topics over the past year: Transfer of general education credit from Ivy Tech to four-year institutions; Ivy Tech program transfer agreements with universities, Methods by which secondary students can earn postsecondary credit; Educational attainment of Indiana s population, Degree production of Indiana institutions; Mobility of postsecondary graduates; and Structure of Two-Year Degrees. Based in part on discussions that have taken place as a result of the working papers just cited, a policy on associate degree programs offered at public institutions has been developed. The intent of the policy is to clarify degree designations and discussion about degree content, facilitate transfer of credit so that as many students as possible will have the opportunity to continue their postsecondary education, and sharpen institutional missions. 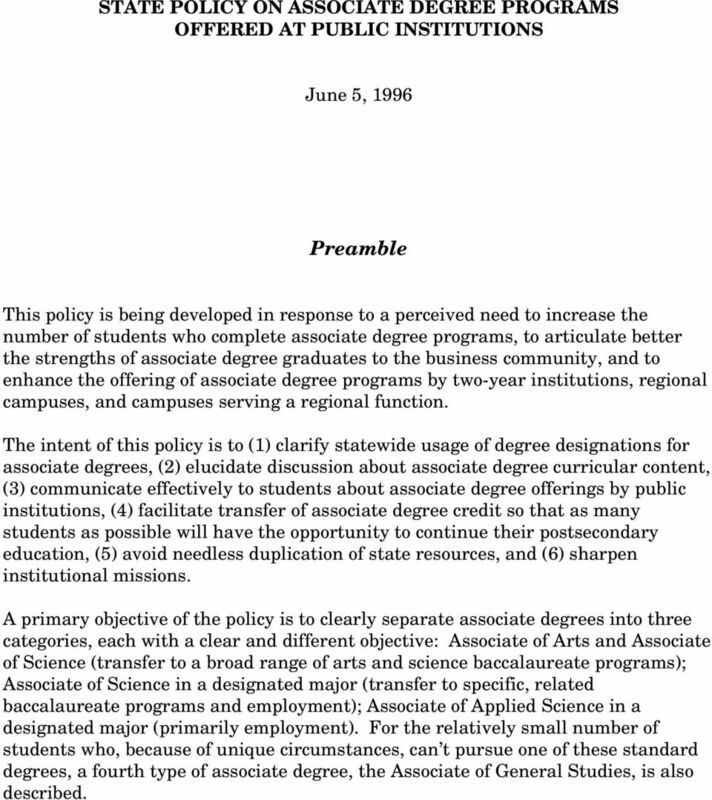 3 STATE POLICY ON ASSOCIATE DEGREE PROGRAMS OFFERED AT PUBLIC INSTITUTIONS June 5, 1996 Preamble This policy is being developed in response to a perceived need to increase the number of students who complete associate degree programs, to articulate better the strengths of associate degree graduates to the business community, and to enhance the offering of associate degree programs by two-year institutions, regional campuses, and campuses serving a regional function. The intent of this policy is to (1) clarify statewide usage of degree designations for associate degrees, (2) elucidate discussion about associate degree curricular content, (3) communicate effectively to students about associate degree offerings by public institutions, (4) facilitate transfer of associate degree credit so that as many students as possible will have the opportunity to continue their postsecondary education, (5) avoid needless duplication of state resources, and (6) sharpen institutional missions. A primary objective of the policy is to clearly separate associate degrees into three categories, each with a clear and different objective: Associate of Arts and Associate of Science (transfer to a broad range of arts and science baccalaureate programs); Associate of Science in a designated major (transfer to specific, related baccalaureate programs and employment); Associate of Applied Science in a designated major (primarily employment). For the relatively small number of students who, because of unique circumstances, can t pursue one of these standard degrees, a fourth type of associate degree, the Associate of General Studies, is also described. 4 Policy 1. Associate of Arts and Associate of Science. Associate degree programs that are expressly designed to provide the first two years of baccalaureate degree programs in the traditional academic arts and science disciplines and/or to meet the general education requirements of a baccalaureate degree, and that make no claim to prepare students for employment, should: a) Carry the degree designation of Associate of Arts (A.A.) or Associate of Science (A.S.); [The Commission s intent is for these programs to be transferable to a broad range of baccalaureate degree programs in the arts and sciences. 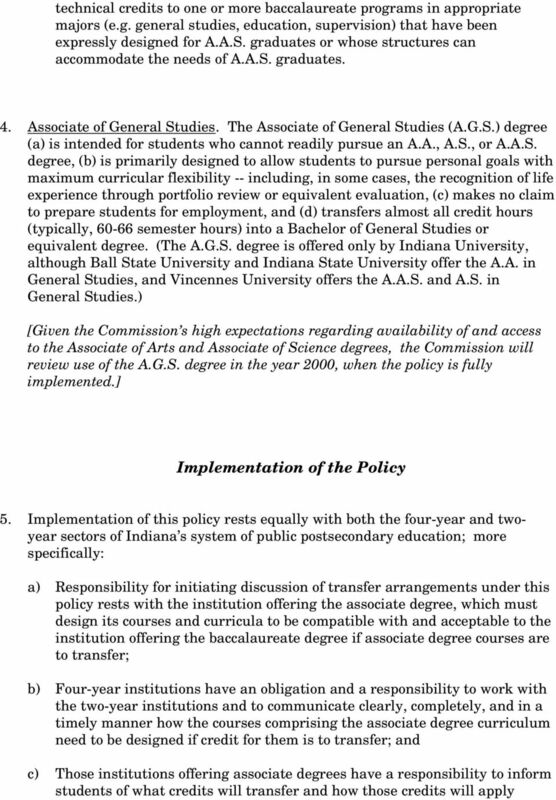 In the Commission s view, designating a specific program major for these associate degrees may limit the range of arts and science disciplines into which credits will fully transfer and may mislead some students to believe these programs have been designed to prepare them for employment.] 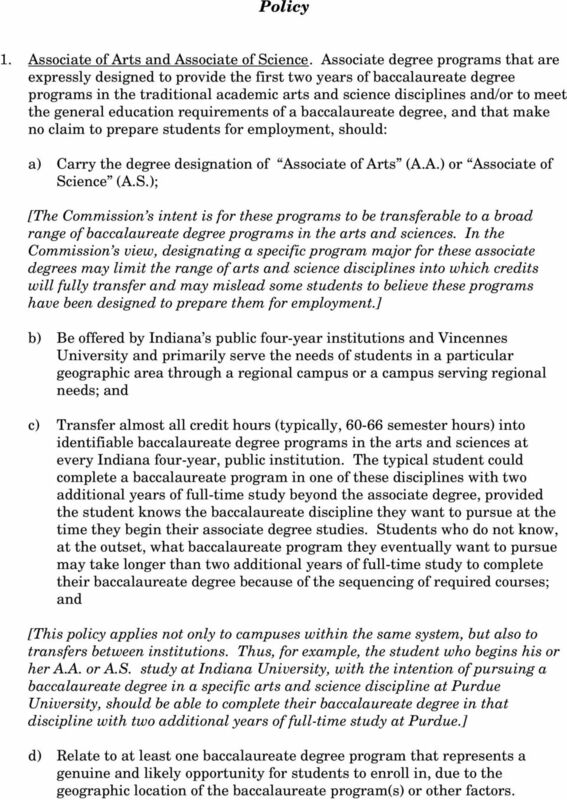 b) Be offered by Indiana s public four-year institutions and Vincennes University and primarily serve the needs of students in a particular geographic area through a regional campus or a campus serving regional needs; and c) Transfer almost all credit hours (typically, semester hours) into identifiable baccalaureate degree programs in the arts and sciences at every Indiana four-year, public institution. The typical student could complete a baccalaureate program in one of these disciplines with two additional years of full-time study beyond the associate degree, provided the student knows the baccalaureate discipline they want to pursue at the time they begin their associate degree studies. Students who do not know, at the outset, what baccalaureate program they eventually want to pursue may take longer than two additional years of full-time study to complete their baccalaureate degree because of the sequencing of required courses; and [This policy applies not only to campuses within the same system, but also to transfers between institutions. 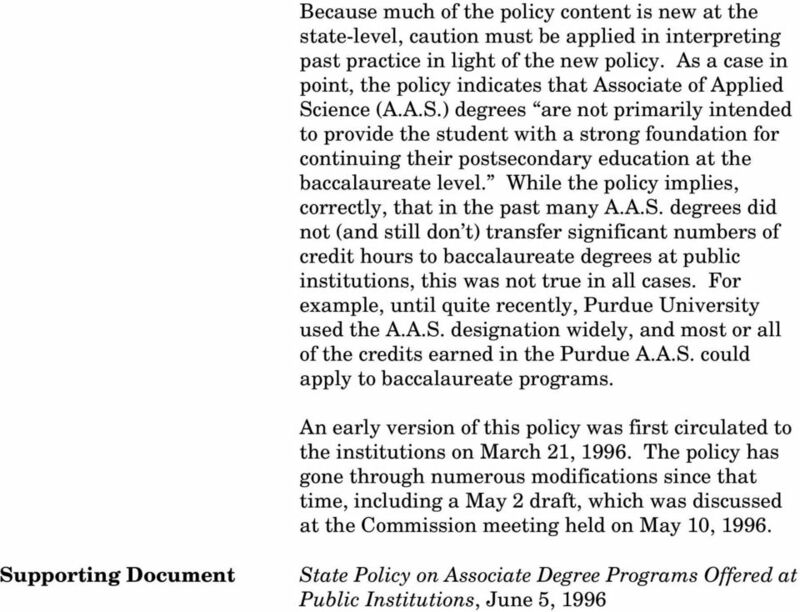 Thus, for example, the student who begins his or her A.A. or A.S. study at Indiana University, with the intention of pursuing a baccalaureate degree in a specific arts and science discipline at Purdue University, should be able to complete their baccalaureate degree in that discipline with two additional years of full-time study at Purdue.] d) Relate to at least one baccalaureate degree program that represents a genuine and likely opportunity for students to enroll in, due to the geographic location of the baccalaureate program(s) or other factors. 7 toward meeting the curricular requirements of appropriately related baccalaureate degrees. and d) Institutions seeking approval to offer new A.A. or A.S. degree programs must have all required transfer credit arrangements finalized before the Commission will consider their proposals. 6. 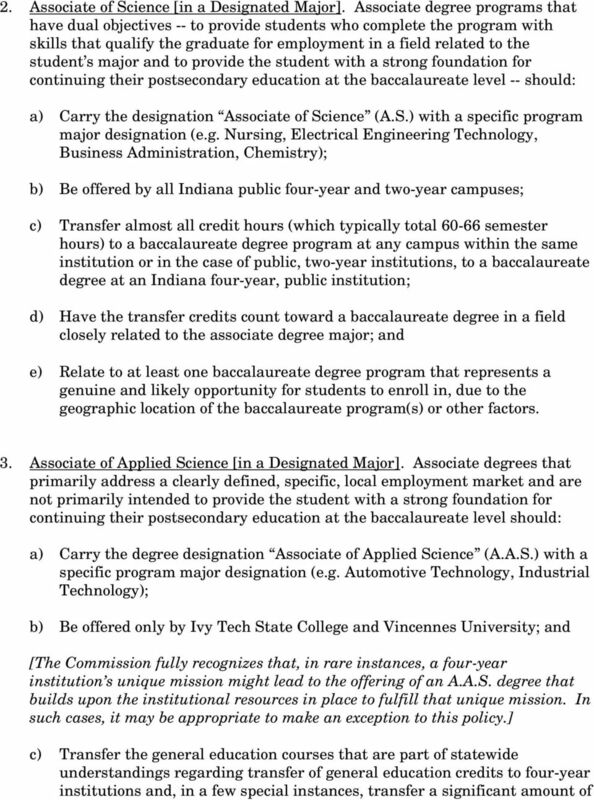 With respect to Associate of Applied Science degree programs, a) All four-year institutions are encouraged to develop, or market more widely if they currently exist, one or more baccalaureate programs in appropriate majors (e.g. general studies, education, supervision) that have been expressly designed for A.A.S. graduates or whose structures can accommodate the needs of A.A.S. graduates; and b) Two-year institutions should present and market -- where appropriate and to the greatest extent possible -- evidence of third party program accreditation and/or certification of graduates as a way to communicate program quality to prospective employers. 7. The state should establish the goal of fully implementing this policy by July Toward this end, all institutions should identify, by December 1996, which of their two-year programs fit into the categories of associate degrees described in the policy. 8. 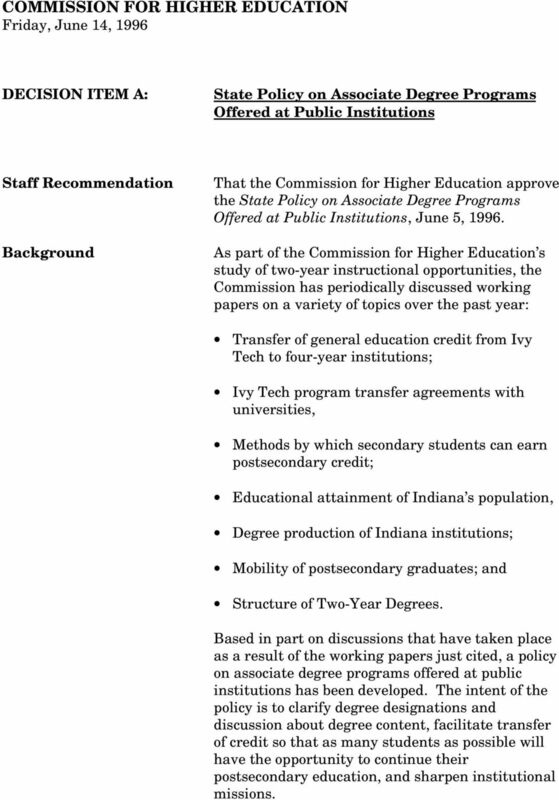 The Commission for Higher Education should annually monitor progress toward fully implementing this policy. 9. The Commission for Higher Education may authorize exceptions to this policy for a compelling set of reasons and circumstances.